Moto3 world champion Danny Kent was able to enjoy a couple of days after winning the world champion to take stock of his achievements but with his Moto2 testing campaign starting in Jerez today he had precious little time to down tools and relax. 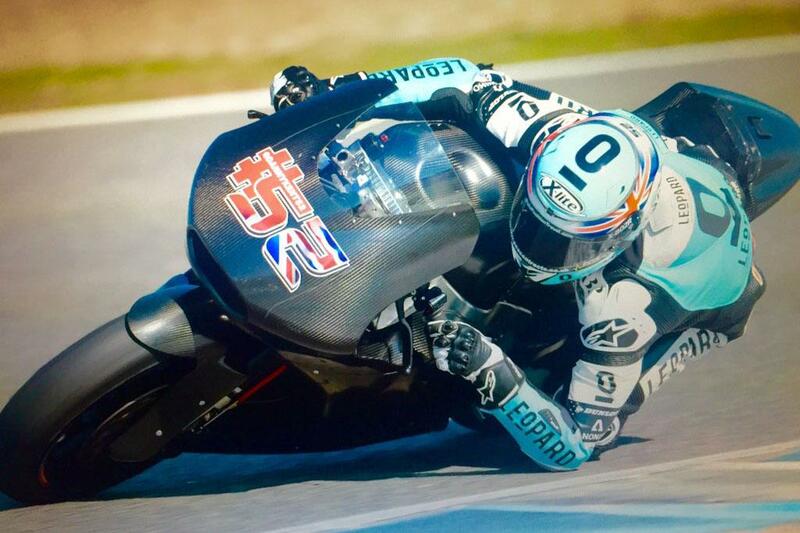 The three day test at the Southern Spanish circuit saw Kent skip the first day of running. Instead today marked his first opportunity to have his first experience of the bike he'll ride next year. Kent was able to ride a 2016 Kalex chassis with WP suspension and afterwards he was pleased to have had a productive day. "Today was a big relief because I had a bad experience in Moto2 in 2013," said Kent. "Today was good though and I went six tenths faster than I ever went around Jerez on the Tech3 bike. That first day is definitely a positive and the fastest rider out there was Rins. He was half a second faster than the pole time from this year and we're only 1.8s off him. We've still got a lot to learn but today was really good." Kent will move up to the intermediate class with the Kiefer run Leopard Racing squad that he won his title with. Being able to maintain consistency with his team and his crew was a huge positive for the 21 year old. "I think that we've got a great team around for this year but it takes a lot of hard work and dedication to get the results and win races. I said to the team how important it was to get this test under our belts because it will mean that I'll be able to spend the winter making sure that I'm training in the right way." One potential issue for any rider moving into the Moto2 class is the extra physicality of riding the bike compared to the Moto3 machines but Kent had no problems adjusting to the bike. "Today I had no issues, no arm pump or anything else, so that's a positive. I've never had a problem, even when I raced here before, so it's not something that I think about."